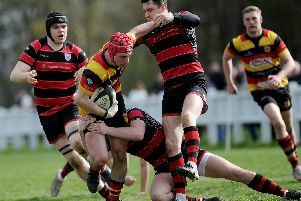 Harrogate RUFC managed this and more, garnering no fewer than eight bonus points during that impressive three-month winning streak, however their pursuit of the North Premier’s solitary play-off berth has ultimately ended in disappointment. Dave Doherty’s side went into their final fixture of 2018/19 needing to better the result of second-placed Blaydon, and although the Aces beat Sandal by a 24-13 scoreline at Rudding Lane, that victory did not prove to be sufficient. Elsewhere, the Tynesiders thrashed whipping boys Vale of Lune 87-15, meaning that they end the campaign on 100 points and have the chance to go on and try and secure a spot in National Two. For ‘Gate, who sign off with a tally of 98 points to their name, it is a case of so near, yet so far as they are left to reflect on what might have been. One more victory over the course of the season would have been all that was required to leave them with a shot at sealing a return to the division they were relegated from in 2017. They couldn’t have done much more in recent months, however, beating Blaydon and then inflicting a first loss in 21 matches on champions Hull, while absolutely blowing away some of their weaker opponents. Unfortunately for ‘Gate, a freak 3-0 defeat at Wirral in early January and a front-row injury crisis that contributed to surprise home reverses to Kirkby Lonsdale and Alnwick before Christmas have ended up proving very costly. Yet, with a young and hungry side who now seem to have added real consistency to their game, Doherty will be hoping that the stunning form of 2019 can be carried into next term and used to fuel a genuine title bid. Their farewell outing of this season did not begin too well as Sandal took a 25th-minute lead courtesy of Will Morecambe’s try. Andrew Lawson's touchdown followed by a Nathan Wyman conversion then put Harrogate 7-5 ahead, before a penalty nudged the visitors back into the ascendancy before half-time. After the break, the Aces responded with a score from Sam Brady following a driving maul at a line-out, Wyman again kicking the extras for 14-8. A Wyman penalty then stretched the gap before flanker Hugo Tasker became the next player to make it over the whitewash. Wyman converted once more, and although Sandal grabbed a second try late on, ‘Gate had already done enough.